“Where’s your mother?” my father asked, fumbling with his keys and, more significantly, his emotions. He couldn’t bear to go inside to look for her. So I did. She stood in the kitchen, weeping, clutching the book. “Are you having a hard time, mom?” I asked. “It was his favorite book,” she sobbed, showing me Sylvester and the Magic Pebble. I remembered the book well. It is the story of a donkey, Sylvester, who accidentally, magically, turns himself into a rock, and the year his parents spend looking for and mourning him before he finally, miraculously, returns. The book had always made her cry. “I wanted to bury the book with him,” she said. And we got in the car—for the first time since my brother was born thirty-seven years before, a family of three—to bury my brother and his favorite book. Books had always been important for us. Not only for my mother (a reading teacher) and me (a writer) but for my father and brother as well. I can see now, as a parent, how stories become the stuff that brings a world into being, the stuff that brings the individual into community. There was a little bit of Sylvester with my brother always—it made sense to bury the book with him. 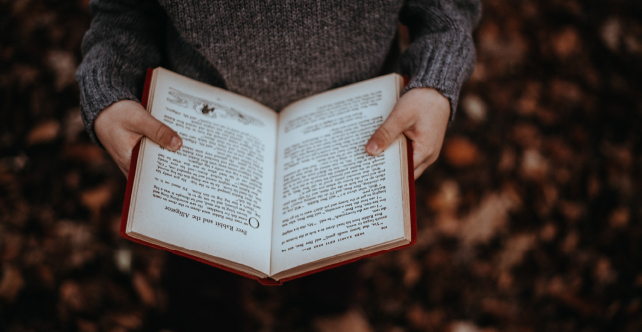 Books allow for the emerging interior self to connect to the broader world through space—in broadening one’s sense of possibility and interrelatedness—and time, in connecting us to the stories of the past. Even before there were books, human beings told stories. Before we spent our evenings around the light of the television, we sat around the fire. And we—not a box with a screen—told the stories. Storytelling was among the earliest art forms and, like all art forms, was participatory. The story comes into being not when the writer puts it on paper, but in the space in between reader and writer, between the teller and the listener. The participatory imagination of the audience co-creates it. And together, worlds are created. The oldest stories are stories of creation, stories that always end with the listener; for a creation story tells us not only about the cosmos beyond, but the cosmos within us, not only tells us the history of our world, but how we fit in it. Telling stories, as much as anything else, makes us human. It is our especially human way of making a world. There are no spiritual traditions I know of that do not revolve around stories. Students of religion and converts so often start in the wrong place, with philosophies and theologies, or worse, lists of rules. If you want to understand a spiritual tradition, the place to go is the story. For in the story, the hardest questions are asked: Who am I? Why am I here? Where are we going? And stories, like faith traditions, are alive. We like to think of them as being one thing, written down at some point and never changing. But the truth is that what it means to be a Christian or a Jew or a Buddhist or a Hindu has been changing throughout history, and is always contextual. The apparent solidity of the written word belies the fact that the story evolves, too, even when the words on the page do not change. For contexts change, and with them, interpretations. If we want to understand the Hebrew Bible, for instance, we are better off looking at the Exodus story than merely the Ten Commandments. In either case, there is a complex set of contexts the help bring the texts to life. Scholars can help us come to understand the historical context, of course. But it is the participation by the reader in the text that truly brings it to life: The captivity in Babylon has more meaning, and even new meaning, through the eyes of those in captivity, the migrants and the incarcerated; American Christianity only truly could understand the Exodus story through the eyes of Black America, a people who became a people in their yearning to be free. These special stories are called “myths”. Sadly, we’ve turned that word into an insult. It has become something like a synonym for a lie. But myths are simply stories that tell us something more important, more essential, than mere facts. They give us a sense of who we are and our place in the cosmos. They allow us to grapple with truths that are paradoxical and that aren’t necessarily a matter of knowing information. Another way of putting it is to say that the myth is the primary way that a culture conveys a cosmology. And a cosmology is not merely about the universe out there; it is about the universe within. It links individual and whole. The question we all have, I suspect, is not so much about what happens to us after we die but whether or not we are alone in the Universe. Are we participating in a community or not? Are we essentially interconnected or isolated? If we are alone, no afterlife we seek after would be worth much; for me, even a blink of an eye with the possibility of true communion with others would be preferable to such an eternity. And we are brought together by the story, the fabric of our social, cultural, and spiritual ecology. “We are in trouble just now,” writes Thomas Berry, “because we do not have a good story.” Berry is writing about industrial civilization and the story we have—told through the mechanisms of consumer capitalism—that teaches us that our world is a “collection of objects” to be exploited. It is the story that tells us we are fundamentally alone and in competition with one another, the story that we become who we are based on what we can buy. And the “trouble” he refers to is the imminent ecological, planetary collapse due to our overconsumption. Neuroscience tells us that the story is the way we process and integrate information. Modern mass media saturates us with information, overwhelms us with it. We have nowhere to place it, no way to integrate it. This is one of the effects of the Tech Revolution. We are maladapted to process and integrate the narratives we digest today with the proliferation of mass media. The work of making a myth, mythopoesis, is the work of making a world, a psychic world within each of us that is shared through culture. Symbolically, this world is conceptualized through the mandala, the map of the soul and the map of the world that is, essentially, the same—micro- and macro-cosm. Simply put, it answers the most fundamental of all questions: Who am I? The myth of Modernity—the story that Berry is suggesting isn’t good enough—tells us that we are fundamentally consumers, defined by what we buy; that we are isolated individuals, separated from the web of life; and that we are part of a mechanistic, machinelike world. There is no more important work than re-imagining this story. And it is work that requires not merely the mind, but the whole self. It requires not merely an individual, but an entire culture. The new story will be more tapestry than a single cloth, more library than single text. To bring forth a new myth requires work that is deep and hard. We must get outside and get our hands dirty to re-embed in the earth; we must explore our interior lives and do the soul-work that brings about the deepest insights; we must engage the old story with critical consciousness to become, in the Gramscian sense, philosophers for the people; we must sing and dance and play and explore. My suspicion is that the new story must come from the margins, from those who haven’t been served by the story we have now. This was an insight that Jesus seems to have had. He didn’t seek out the temple priests or the Greek elites or Roman power; rather, he went to those who were, as he was, at the margins of society. There was a wisdom from those margins that could not be found at the centers of power. Indeed, in today’s world this would mean turning away from the university and looking to the streets, away from Wall Street and toward the shanty towns outside the centers of capitalist power. It means turning to the “creatively maladjusted”, those who do not adapt to an insane world and instead attempt to re-imagine it. It is the kind of wisdom that the Trickster tales teach us: that there is an insanity in the work of building human civilization, and to appear mad in the face of it is a deeper wisdom than conforming to it. But those at the margins, of course, are taught that they are there because of their own deficiencies. “Choices” is a word we will here over and over again in our poor schools, the schools that send more of our youth to prison than college—as if life were so simple, as if mere individual choices determine our fate and there is not a whole universe of other choices conspiring to affect us as well. This is the deficit narrative. The reclamation of the narrative is the counter-narrative. This must be a central aspect of any worthwhile educational program for the marginalized. It was what Jesus and Chuang Tzu and Baal Shem Tov, to name a few, offered: A narrative that challenges the one we have been given. And while it isn’t my place to dictate what a new myth might be, I would make a few suggestions: It would be a story that speaks to the world not as machine but as living organism, a dynamic process of birthing. It would a story that speaks to our interconnectedness, privileging relationship over the individualism of capitalism. It is easy to see, I think, how a counter-narrative might be useful for the oppressed. But we must come to terms with the fact that the condescending term “at-risk”, applied most to black and brown youth, applies to all of us. We are an at-risk species on an at-risk planet. Our work, our great work, is to tell a new story for us all. Anything less is the rearrangement of deckchairs on this planetary Titanic. Apocalypse is the end of a story. It is the cultural moment when the old stories no longer speak to the people. It is the moment when new stories must be revealed, created. The new myth, therefore, is the product of the great re-imagining, the way to survive not only our physical peril, but also the spiritual peril of a life without the meaning that a good story provides. We made it to the cemetery, and I stammered through the eulogy. My brother had little patience for intellectual and spiritual laziness and preferred to face the unknown with honest unknowing. Telling people what they want to hear makes a lot of money in the pulpit, but to honor my brother I had to tell another story: that life is hard, and short; even the luckiest among us gets a mere blink of an eye and cannot avoid suffering. It is funny that the stories of so many of our great spiritual icons—Jesus and the Buddha, for example—are stories of this encounter with suffering, and yet our religious institutions so often seek to avoid its reality. I held my mother as she placed the book in my brother’s grave. His sons stood uncomprehendingly in the face of eternity. It was autumn. For a moment, in the stillness of the cemetery, I could feel the movement of seasons. Off in the distance there was a high school. My brother had played football there once in high school, my mother said. Like the seasons, stories bring us into participation with the cosmos. We will all die. My brother’s ashes were placed in the earth like the bodies of his ancestors. And like the seasons, stories come back. The spirits of our ancestors live on in story. They do not remain static. We can participate with stories, change them. They are there to serve us now and in the future. It matters less if Jesus said exactly the words written down in the Bible than how those words come alive for us, make our lives meaningful, and, of course, what we do with those words. Words make worlds. And the mythology of my brother can be the way he remains with his sons in some small way. This is a selection from The Wayfarer’s spring 2018 issue. Order the entire issue in either print or e-edition in our store. 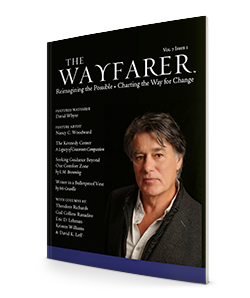 The Wayfarer is a biannual magazine released in print and e-edition every spring and autumn. We publish a high-quality journal of literature and art that inspires and points the way for visionary-yet-practical change. By our definition, a “wayfarer” is a wanderer whose ability to re-imagine the possible provides the compass bearings for those on their way. The Wayfarer’s mission is to chart the way for change by building and empowering a community of contemplative voices. We seek to release a publication that builds and empowers a community of contemplative voices and serves as an agent for cultural transformation. Theodore Richards is the director and founder of The Chicago Wisdom Project, a core faculty member of The Fox Institute, and the author of six books. 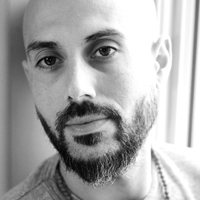 He is the recipient of numerous literary awards, including two Independent Publisher Awards, The USA Book Award, and the Nautilus Book Award. He lives in Chicago with his wife and daughters. For more information go to his website, www.theodorerichards.com. To bring each issue of The Wayfarer to fruition, it takes hundreds of hours each season to craft, edit, design, and distribute the journal. If you find joy and enrichment within our features, please consider becoming a supporter with a small donation. There is no set amount. Whether it is .99 or a few dollars, we appreciate any gift you care to give. While at this time we are not a non-profit all donations do go towards ensuring the future of the journal. Help us Empower Change by Giving a Little Change!